By Elizabeth Galeria, Mark Vezina and Jerry Grove on Aug. 25, 2014 at 2:38 p.m. 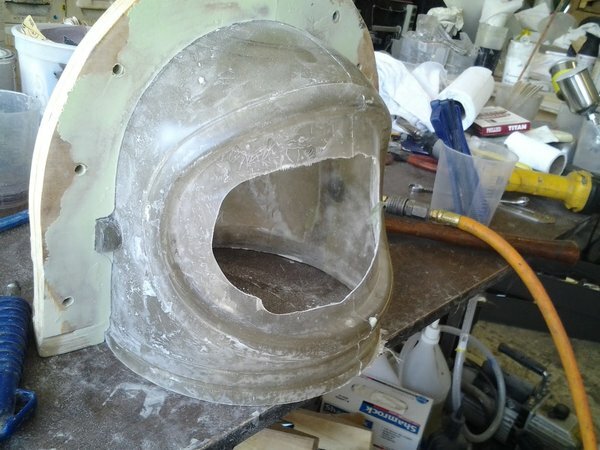 Reproducing a Mercury spacesuit helmet, even with a good blank sculpt to start, is no easy task. 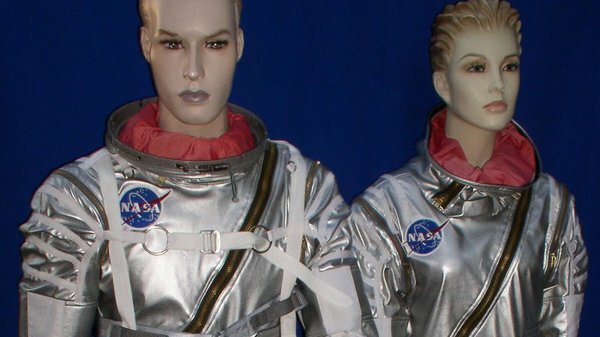 When Adam commissioned us to make a hybrid NASA Mercury space program suit, we didn’t give much thought to the helmet or really any of the “hard parts” with the exception of the neck and wrist rings. 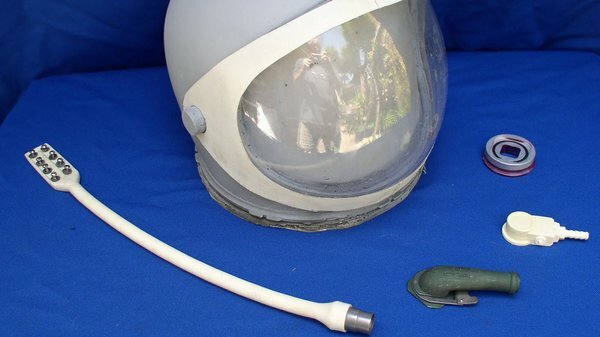 We just figured that if anyone was interested in buying another suit, they would have to find a helmet on their own, and that we’d probably have to re-cast or find standalone MIG neck rings. Adam advised us they would be hard to find. Since Adam supplied the neck ring for the first build and we returned it to him, we had to find another for our third suit. 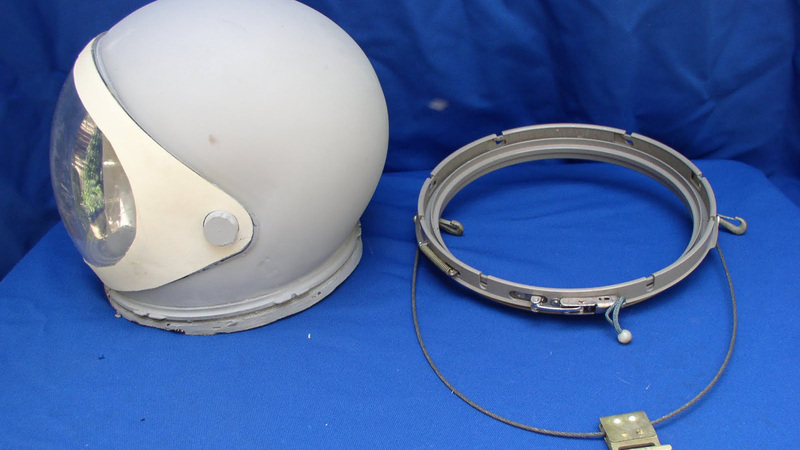 We weren’t really in a hurry to find one but weeks passed and we saw nothing except MIG helmets with rings, so we bought one hoping maybe we could sell the MIG helmet later. The upside of buying the helmet and ring was understanding how the ring locked onto the helmet as Adam never sent us his helmet at this point for scrutiny. Now that we’ve had a closer look at his helmet during the Comic-Con Incognito walk, we can see he manufactured a similar locking system we have based on the MIG helmet and neck ring design. I remember Adam saying he needed another neck ring so I kept looking and eventually found one and bought it. Because it was expensive we considered recasting it in four-part molds for future projects. It wouldn’t be functional but may look good enough for some buyers. When I told Adam what we were planning and asked him where he got his helmets he offered to send us his spare helmet blank to re-cast but we would have to return it as it was his only one. I’ve never had quite this experience before. We’ve been lent stuff in the past but nothing that couldn’t be replaced easy enough. 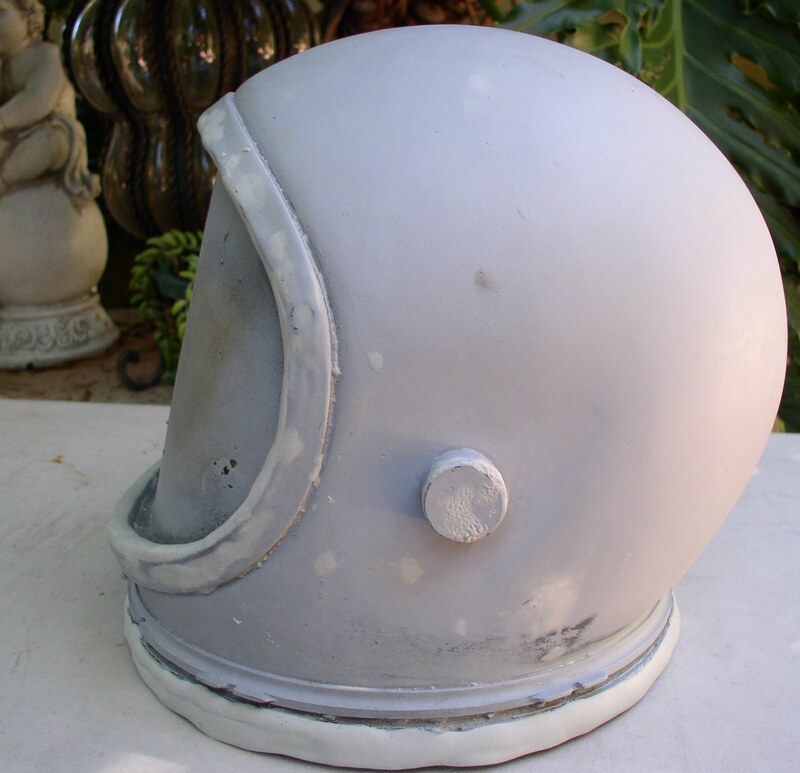 It was very generous for Adam to send his helmet so we didn't have to sculpt one from scratch, and really aligns with his philosophy of opening these projects up to makers. Above is a photo of what he sent over. We were absolutely thrilled to have access to it! 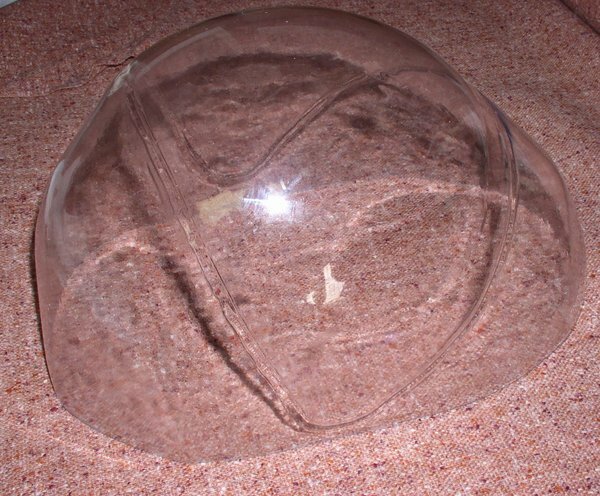 We planned to make a mold and vacuum form the visor, but our vacuum former has some issues and I didn’t budget buying a new one, so I asked Adam where he got his and if we could buy them. 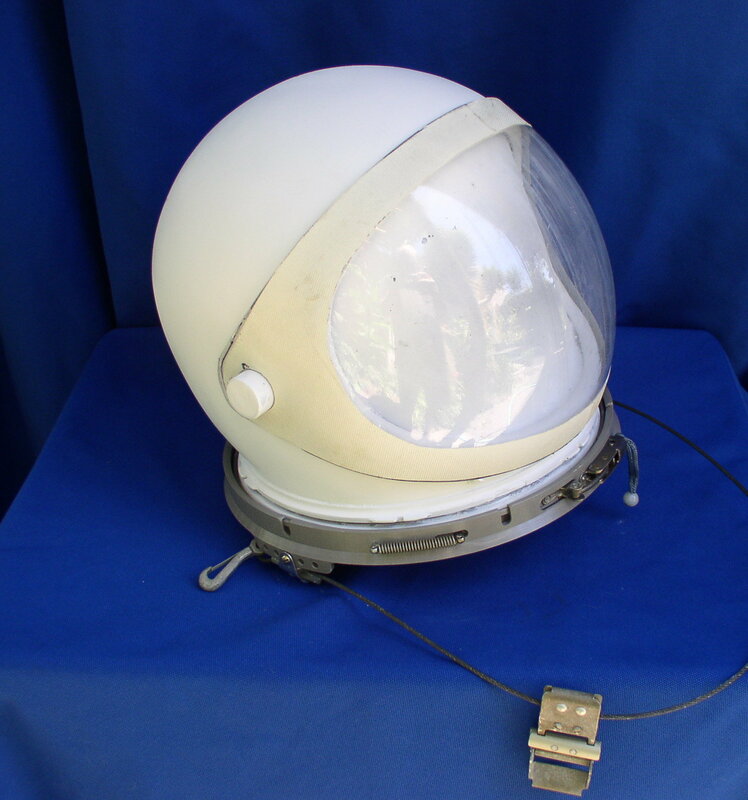 That’s when we started looking at resources for reproducing the visor. In the San Francisco Bay Area we’re aware of a few places that could make a reproduction, but no one really wants to do jobs like this in quantities of less than 100 as a general rule. But we were prepared to finance the project out of necessity. But thankfully, Adam eventually told us where he got the visors and we were able to order 10. One problem solved! This is when we started tinkering with Adam’s helmet. To be honest, after we completely altered it, I felt bad going to Adam and telling him what we did. It was a slippery slope which sometimes happens when you have talented people working with you and there’s been some miscommunication and even misdirection. I own up to this and can’t blame our help. We have to make this right. 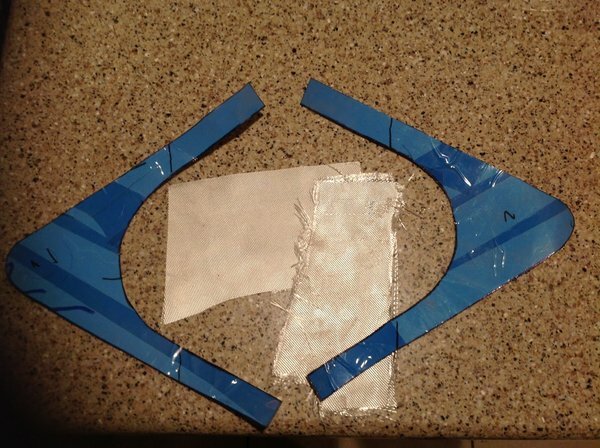 We’re going to make Adam’s helmet blank better so he doesn’t have to bend his new neck ring. Frankly, Adam’s helmet blank had issues, even if we didn't want to believe it. Anyway, there were all kinds of imperfections (nicks, scratches & fiberglass frayed around the collar, etc.) that we had to fix if we were going to re-cast it successfully. I suppose we should have re-cast it “as-is” and only alter our own pull. It was a mistake in retrospect. The more talent we had look at the helmet resulted in even more different viewpoints on how to improve/fix it. We’ve worked with highly qualified mold-makers for a number of years but they were both busy but meant well in their critiques. 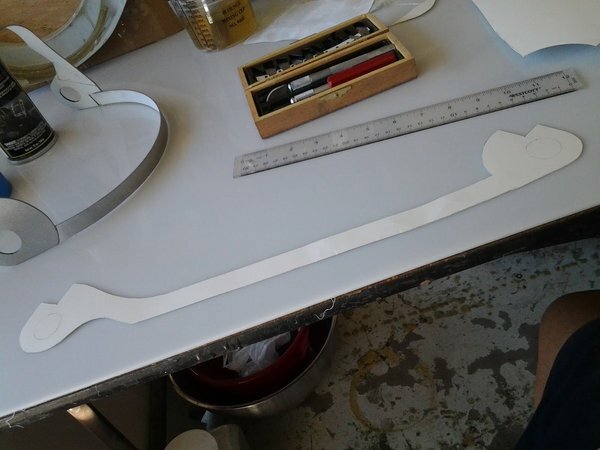 We kept the process in-house initially with seemingly endless prep and indecision about molding. To be honest, we’ve done a lot of molding but this project was perhaps outside our core competencies. We started with Magic Sculpt trying to flesh out the collar area which needed the most work pictured below. 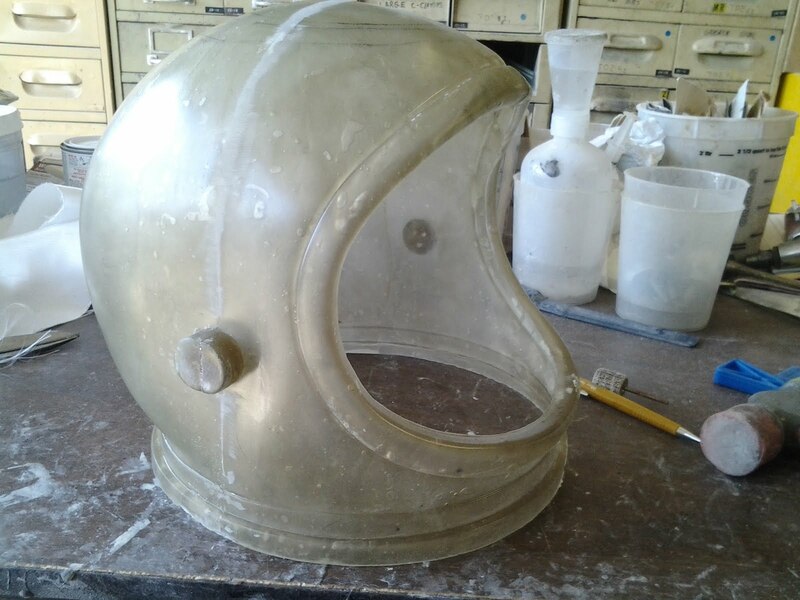 It was essential we get the bottom of the helmet to fit the neck ring and not have to bend neck rings, so that meant building it up and making it truly circular. Many hours went into the prep before our mold-maker Jerry took a look at it and said he’d have to prep it more as he could see all kinds of challenges making a good mold providing clean and easy pulls. That’s when the above ring became important to the build. It came off the MIG helmet we bought and has proven worthwhile in getting the helmet ready to fit the rings. Not all the rings are the same size so we had to figure out where there’s commonality with the 13 rings we bought. We needed at least four pins for structural integrity, but preferably six pins built into the helmet collar after the pulls. This is where we made our first mistake and we hope it proves instructive. 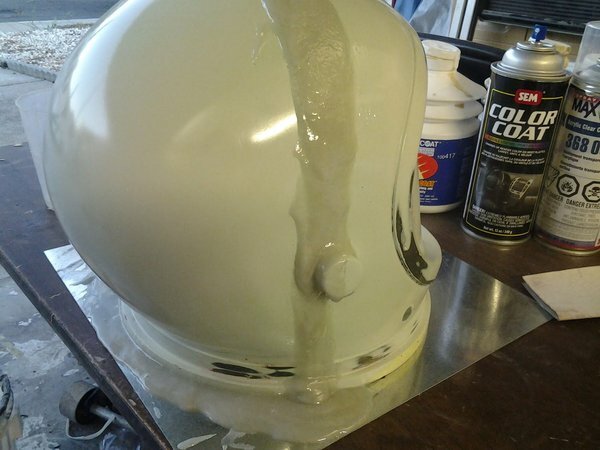 We worked with someone who wasn't a seasoned propmaker and didn't completely appreciate all the details of the original B.F. Goodrich helmet design details. And unfortunately, he wasn't able to do the necessary research before making some decisions. Our moldmaker wondered why the helmet blank had "tabs" around the collar just above the neck ring. We couldn't see them in Adam's pictures and couldn't discern their purpose. And the mistake was was that we decided to grind them off because they would have made the modeling more difficult "as is." The rationale grinding off the faux collar ring and tabs seemed simple at the time. We thought they served no purpose and would need more prepping as they had imperfections. We thought they were not visible on Adam's helmet pictures as they are just above the neck ring with most details concealed. We thought that if we couldn't see them, they wouldn't be needed. And we thought that removing them would make the molding easier and cost us less. Up front, that was the case, but in the long term, it was a mistake. 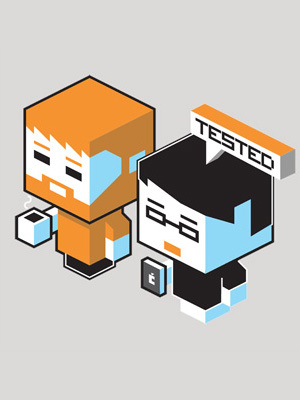 We got caught up in the frenzy of indecision, deadlines on orders, risk, and cost. The final decision came down to what would improve the probability of a successful recasting for the lowest cost. The above and below in-progress pictures show the outcome of that flawed decision making that gets fixed later at an additional cost. The good news is we have two versions of the helmet. That means there are at least three buying profiles for the helmets. Some want the neck ring, some don’t, and some are undecided. 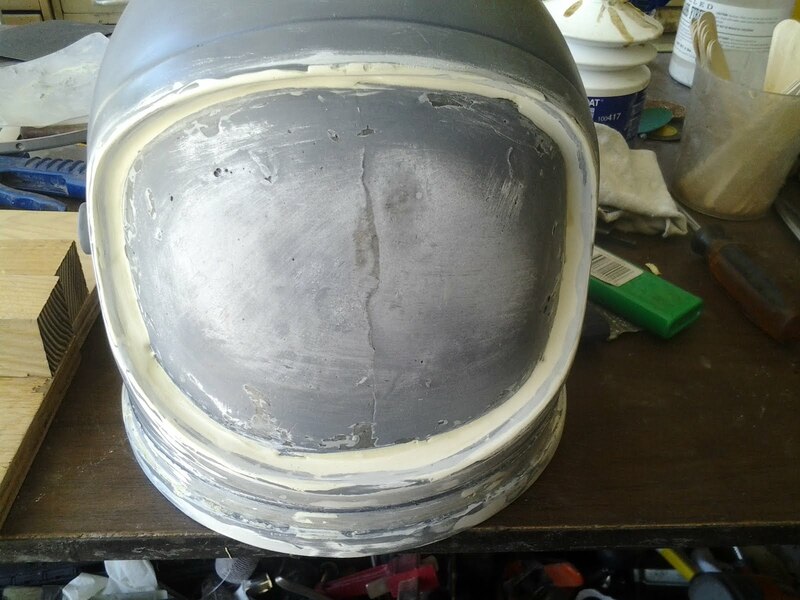 As you can see above we had to add much more Bondo to the the diets and holes to even out the edges for the mold to release easier and for a much smoother look in the final product. 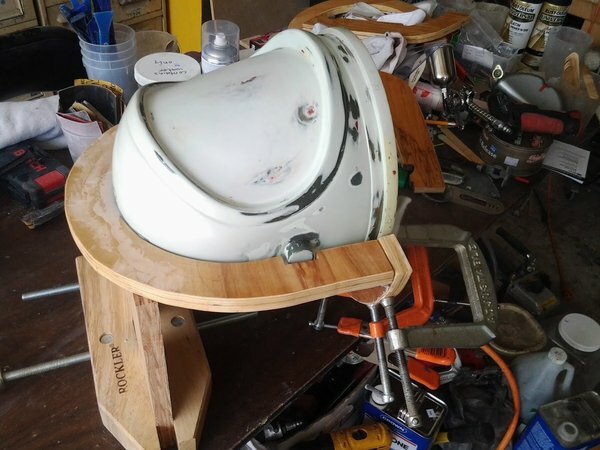 The following pic shows the sanding fixture we made to provide concentric roundness of the helmet bottom to ensure the ring would fit without gaps. We can install all six pins now instead of four so the helmet can lock into the outer ring and look like they are originals. 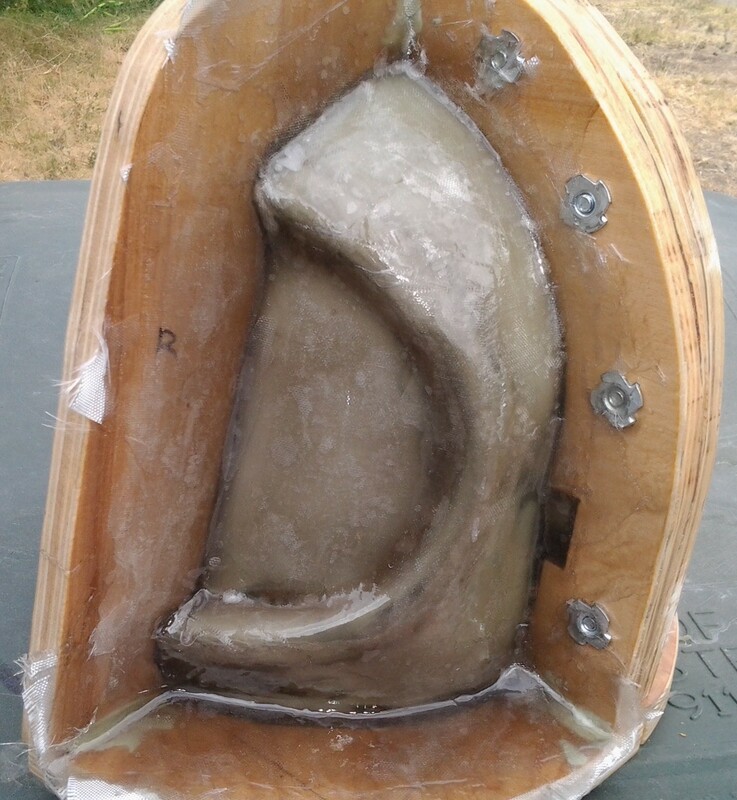 The following pictures show the first front quarter of the face part. As soon as the epoxy sets in the crevices we then fill all of the gaps and lay up the cloth on the open part. 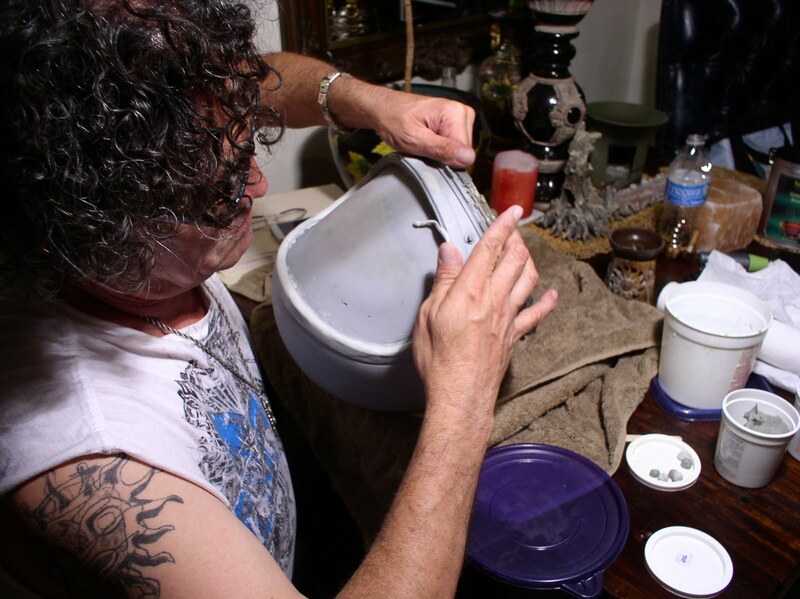 When it cures enough, remove it, sand and grind off the excess, and repeat the same process with the other quarter. 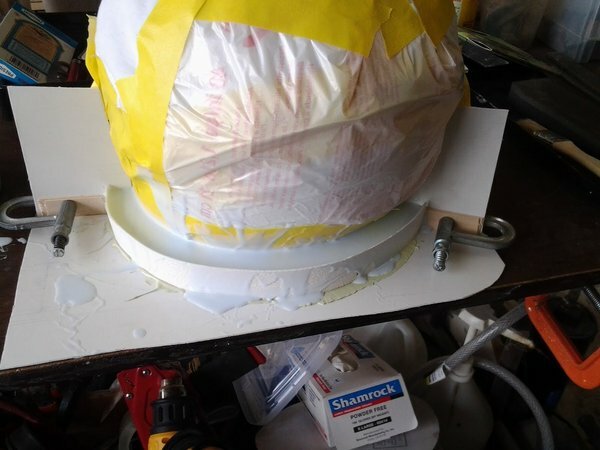 That means removing all the parts, dress up any divots or scratches on the plug, respray with mold release, re-clamp all the made pieces into place, spray again with PVA then start laying up the last quarter mold. A very repetitive process. 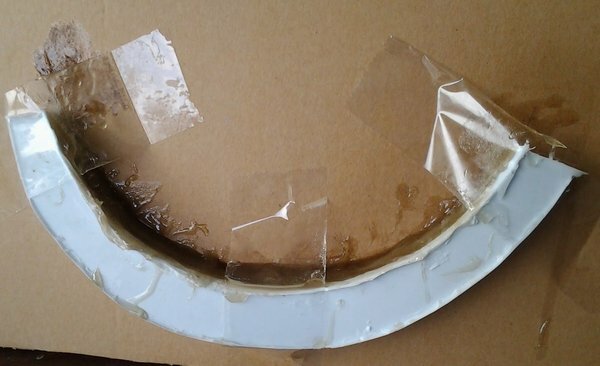 The face or front of the mold is problematic. 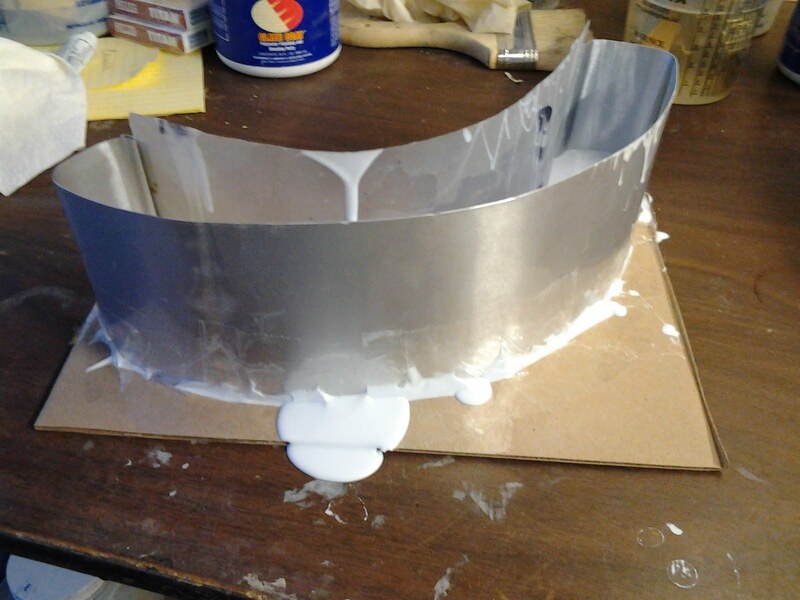 It has a lot of negative angles so we had to remake the mold intended with three halves. These pictures show initial progress for the main first half. We're now doing the second set of two halves to aid in pulling the mold off the plug--then eventually the pull. Here are a few more pics of the rear frame progress. We're starting the front halves so we can hopefully pull them from the face with all of the negative grip angles. It’s been suggested the next mold (v2) has to be a silicone mold to accommodate the multiple crevices and negative grip angles especially since the tabs may have to be part of the next model. Here are some pics of the filling in of the crevices around the wood to the plug interface. 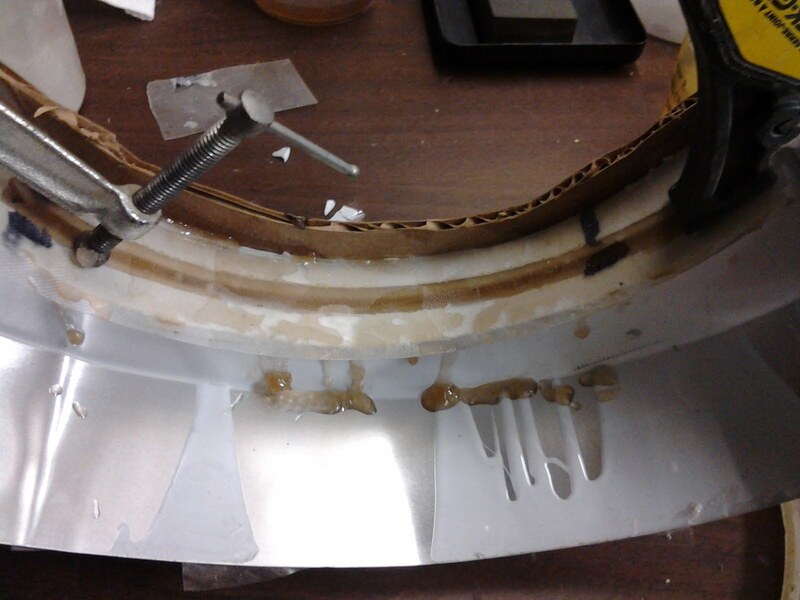 When that is done we will then begin glassing the plug surface. When cured we can hopefully pull it off with the edges and negative angles involved. We will then sand all the edges flush then repeat the process all over again for the last quarter mold panel. The helmet taken out of the mold follows. 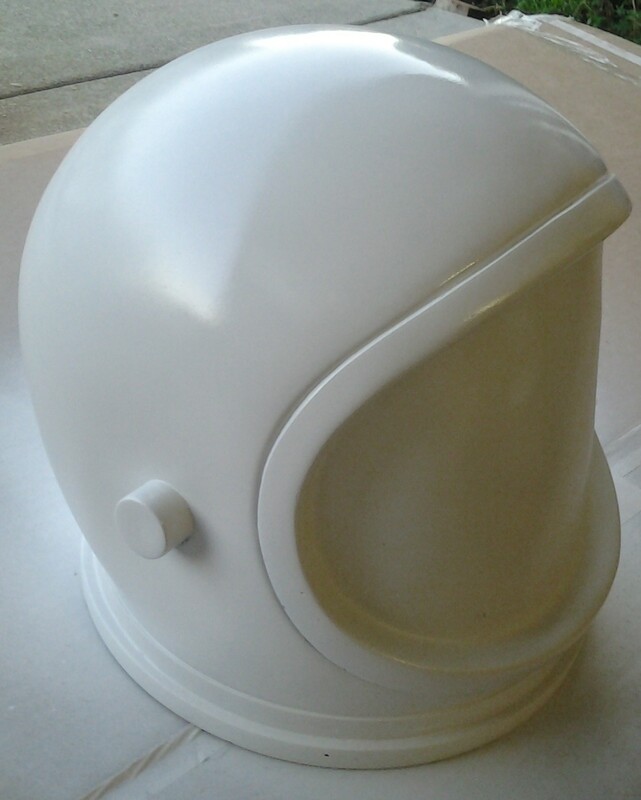 We decided to paint the helmet with gloss white then a coat of clear coat for that shiny look instead of gel-coat. To do the tabs on the next model we may absolutely need to do it with a silicone mold. The above pics shows trimming and prep before sanding. 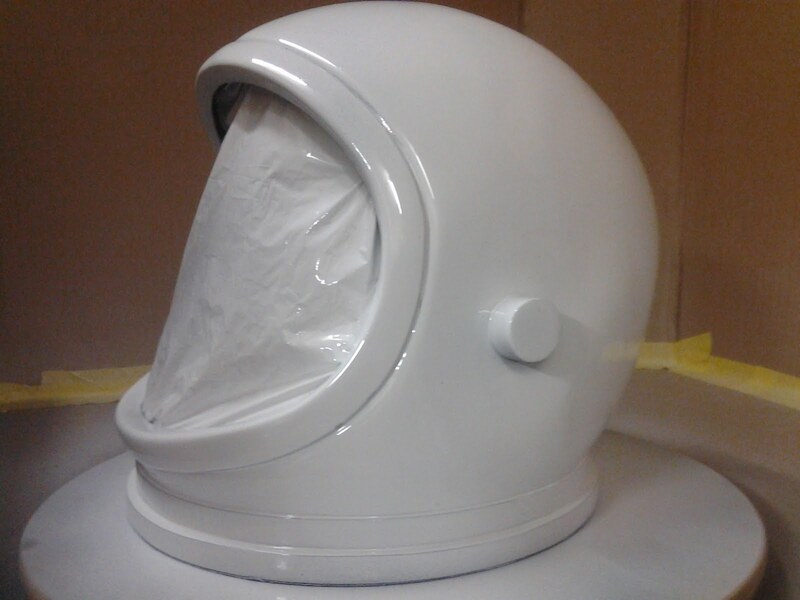 Following are pictures of the helmet with the first coat. When it dries we’ll sand any drips and runs or fish eyes then put on a second coat (maybe a third). We're likely going to take a different approach to attaching the helmet accessories (O2 inlet / outlet) by not cutting holes in the helmet like Adam’s. 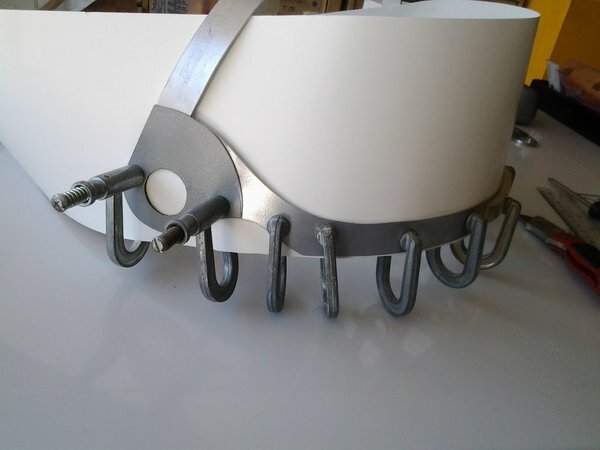 We'll attach accessories with adhesive and a machine screw from inside, simplifying production. Since we ground off his faux collar ring on his only remaining helmet blank we have to right a wrong. Adam informed us the source of the helmet pull is his friend Steve LaBoyteaux. He also provided Adam with the visor and wrist rings. After an introduction from Adam, Steve was happy to help us reproduce his original helmet. Steve sent us his finished helmet to fix our mistakes and he hooked us up with the folks who made the original visor. Steve is also intimately aware of all the details of the build almost on a daily basis and he’s always been there for encouragement, questions and guidance if needed. He has been a tremendous help! Following are some pictures of the work in progress (v2 helmet) to make the mold for the "helmet tabs." First, we have to protect Steve’s helmet. These pics show the silicone poured and now waiting for curing to do the next phase, which is pulling out the mold then pouring in the resin to get a copy of the tabs. Then, we'll clean them up for the next molds to be made for the final version of the new tabs. 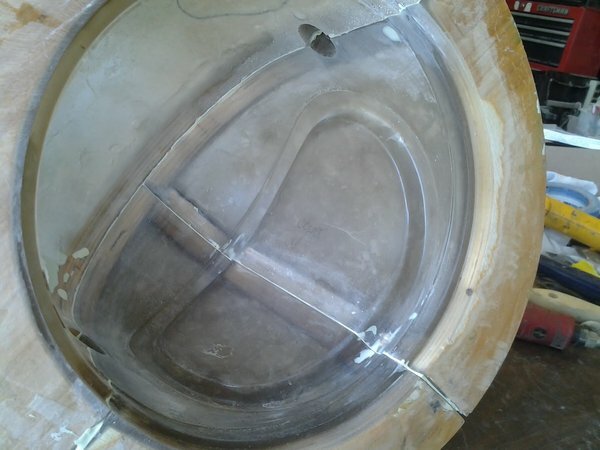 When we redo the plug without the upper ring or ride we wanted ground off, we will re-make a new "hard mold" with better separation segments. We just want a workable hard mold for many more copies than available with silicone molds. The faux collar detail will be added on the V1 helmet for those who want it with or without the MIG neck ring as desired. Some buyers may like the V1 better because it looks more "clean". 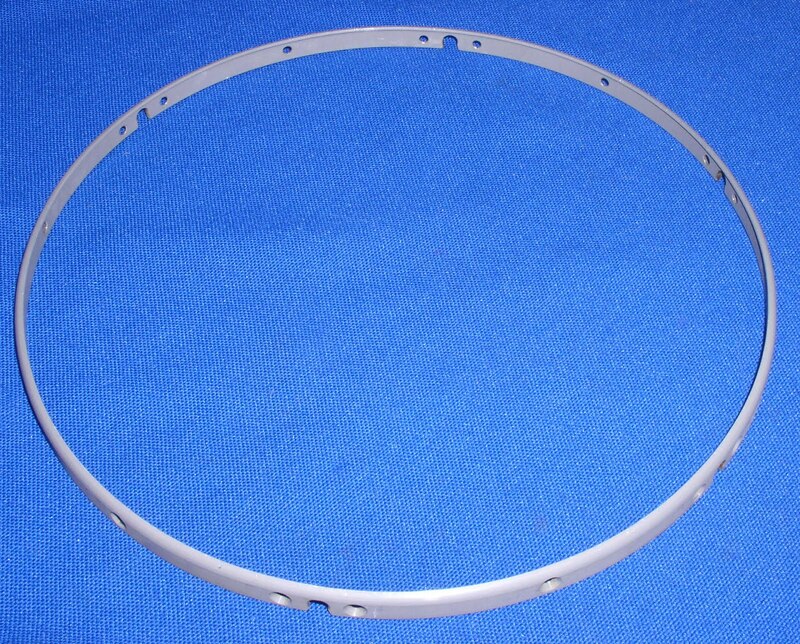 Helmet enthusiasts seeking precise details will want the faux collar ring as it’s a more accurate reproduction. 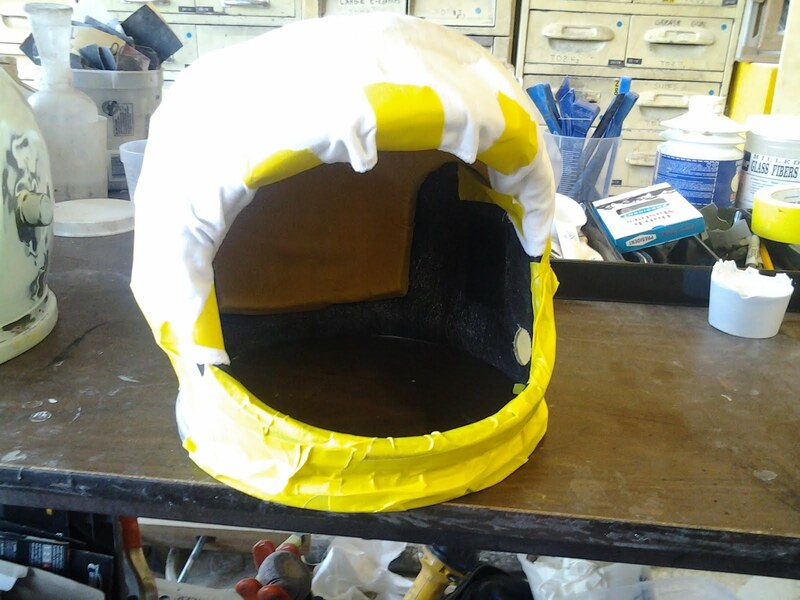 Earlier, we showed you the in-progress visor on Adam’s helmet blank. The following is what the untrimmed visor looks like from the factory that did the vacuum forming. Why reinvent the wheel if someone else already does a good job? We’re probably going to try and commission a more optically clear visor or make it ourselves. Next is the visor tape/banding pattern and fiberglass to make visor band provided by Steve. This shows the pattern being copied from Adams metal visor band on the bottom half of the helmet. 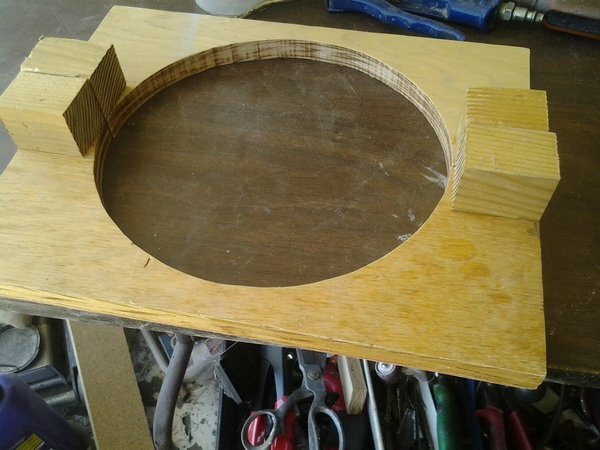 The next step is to transfer the pattern to a piece of plywood, cut it to the shape, and then use it as a pattern to cut/duplicate the pattern onto the sheet metal. Once the pattern is cut, we will roll the pieces to a correct curvature for the top and bottom band, and form the two bands together into riveted pattern with a gusset. 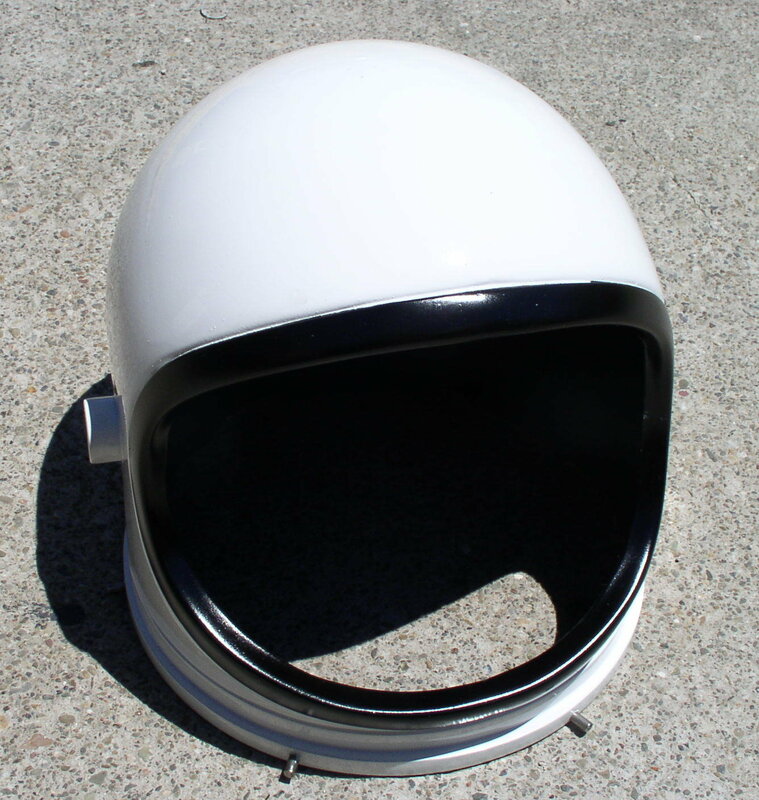 We volunteered to make the rolled aluminum visor guides since Adam is a busy man and we want to demonstrate our gratitude to Adam and Steve for making these helmet builds possible by providing them each with new helmets. Jerry asked me to buy him an English Wheel to manufacture the guides. I asked Adam if he could suggest a make and model because I didn’t want to get stuck with the floor version if a bench top version would be sufficient. We bought an English Wheel and ended up with a floor model that we may never use again--we'd better sell a lot of helmets! We finally made all three ring tab plugs and are readying them for making the final silicone mold for the production pieces. As soon as we get the sheet metal we can go right ahead and make the metal frames. 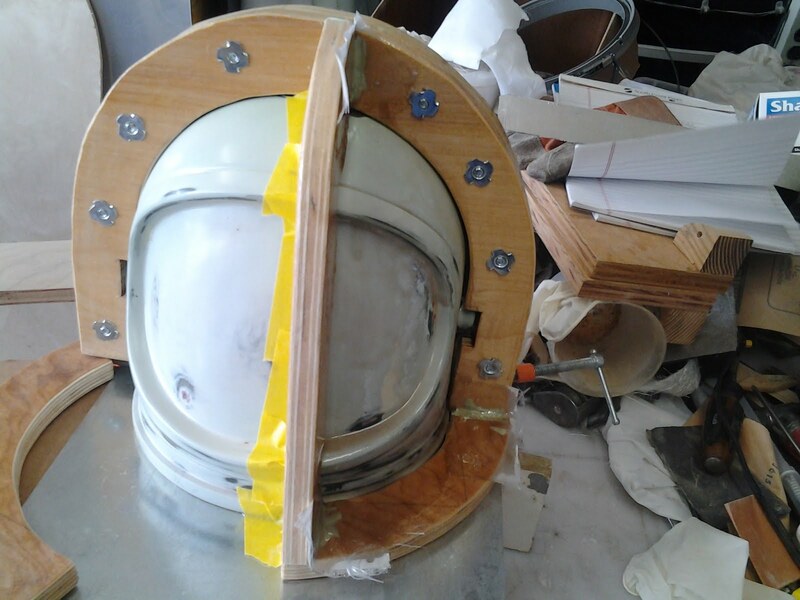 In the meantime, we’re working on making the fiberglass version of the metal visor frame. We have to do a reverse molding process to get the shiny surface facing outwards so it can be painted with an aluminum look. 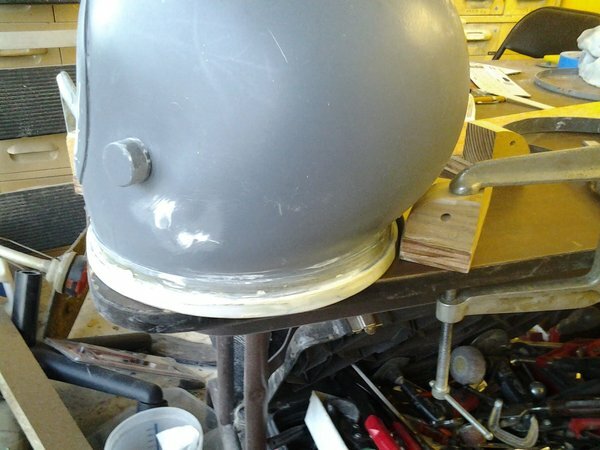 We’re also making copies of the pivot cover caps where the visor frame/visor bubble attach and the polyethylene spacer washer that keeps the spacing from the helmet shell. 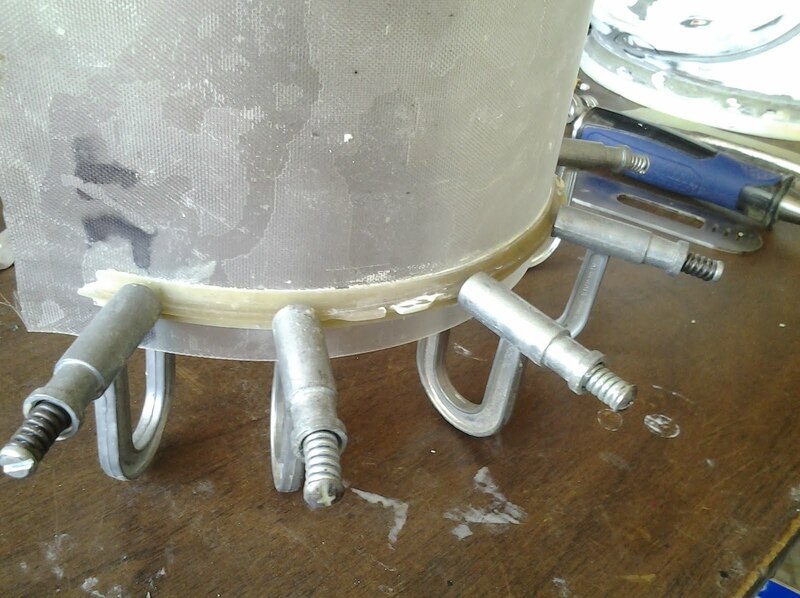 We're also still working on the original plug to clean up all the defects and porous pits that caused the bad paint pin points and sanding the tab ring landing band. We are thinking about how to make the MIG metal neck ring/capture ring (the one with the slots and locking cams) out of a resin mold. Once that is done then we won't have to worry about sourcing them either. It's a lot more work to do but we're on track after early mistakes and mishaps. Next time, we'll update you with more about the casting of the visor and ongoing progress of this beautiful helmet.